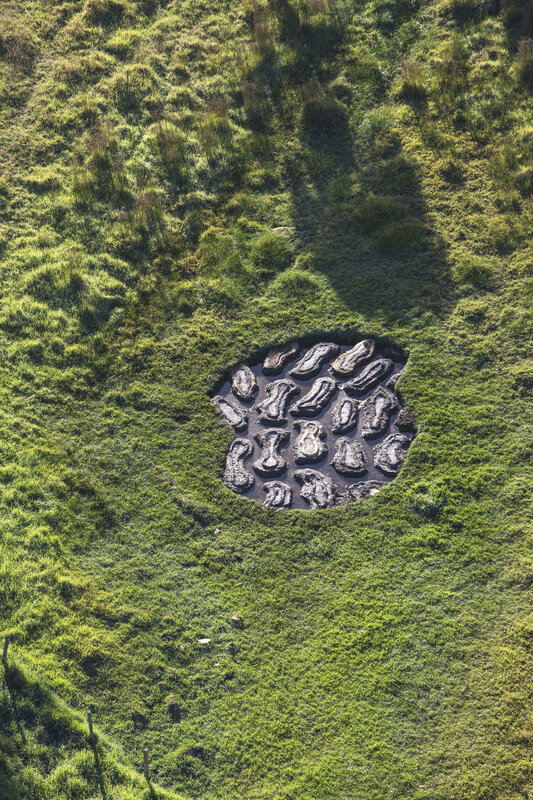 As a Site Specific Environmental artist, Elaine works directly in the landscape, using found local natural materials that allow the stories and characteristics of a place to directly inform her work. Over a two month period in 2017 Elaine developed "Acknowledgement", a Site Specific work engaging with the winter creek of The Farm alongside 'first contact' with the Wardandi between 1830 and 1900, the original inhabitants of this part of the southwest of WA. The work was formed by clearing an area of grass in a creek bed, shaping the underlying clay and soil into mounds and adding contrasting bands of colour lined with crushed clay from other locations on the property. Vivienne Brockman (Wardandi Elder) explains that as spirits pass over, they move through the water and out to the west. This ephemeral work lies on an east-west axis in the waterway, one of the source tributaries of the Ellen Brook. The piece also includes a soundcloud, of a Celtic song sung by Lucy Ridesdale. "Acknowledgement" is an offering from my Irish ancestors to the ancestors of the Wardandi." – Elaine Clocherty. To listen to the song, click here. An ephemeral artwork, it is constantly changing, seeds of the local reeds and ground cover within the soil and clay sprouted and continue to grow, once a dry creek bed the work now lies fully intact beneath the water from winter rains. Elaine exhibited her work, "Acknowledgement", during the Margaret River Open Studios 2017 alongside photographic prints of previous works and short films including the newly completed companion film, "Acknowledgement", a collaborative work with Video Artist Uta Summer.